Need A Coat of Arms? 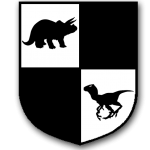 It is probably a good thing I’m not a subject of the British crown or have any eminence to speak of because there would totally be a dinosaur on my Coat of Arms. Read how to get yours.